Colour is my daylong obsession, joy, and torment. Colour is the child of light, the source of all light on earth. My weaving colour choices are an emotional response, a response to some stimulus that has moved me—a flower, a painting, a picture in a magazine. I see something that I love, and then I interpret it in coloured yarns. Sometimes I’m right, sometimes I’m wrong; sometimes it looks stunning, sometimes—less stunning. But the great thing is, there’s always more yarn and there’s always another opportunity to try again and make it better. Hue is easy. It’s what we naturally think of when we think of “what colour” something is: red, yellow, blue, green, orange, purple. If you were a painter, you could easily achieve a wide range of colours simply by adding black, white, or grey to your hue. This changes the lightness and darkness of a colour. 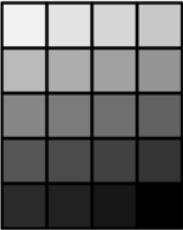 This changes its value, which is the lightness or darkness of a colour. A hue at its purest and clearest, as it would appear in the colour wheel, is said to be at its maximum saturation. As you add grey to a hue, the hue becomes more desaturated—making it less clear and more muted. In the picture below, the outermost ring is the pure hue at its most saturated. As you move in to the centre of the circle, the colour becomes increasingly desaturated. Weavers can’t mix on a palette like painters do, so it is important to play with combinations that might strike you as unlikely, because you’ll be amazed how some of them work in the cloth. I have some favourite moves I like to make when using colour, and I’ll share them with you here. I love gradation work. This is where you can put all the tints and shades of one colour that you might have in your stash. A gradation builds movement across your weaving from light to dark. You can shift through analogous colours, or in and out of one set of colours—for example, dark on the selvedge to light in the middle, or vice versa. I use analogous colour harmonies more than anything else in my weaving. They are the colours right next door to each other on the colour wheel. Analogous colours flow into one another. Gaia uses them all the time: just start looking at flowers! 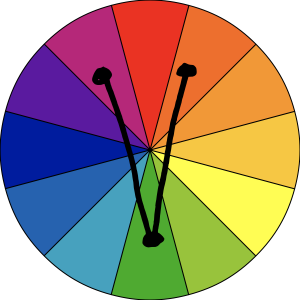 Some colour systems include four colours from the wheel in a row, others three. Personally, I think you can use as many as you want to create your own personal rainbow. If you are working directionally around the colour wheel you can never go wrong. Analogous colour harmonies are the perfect place to start if you are unsure about using colour. Then you can add gradations of light and dark. 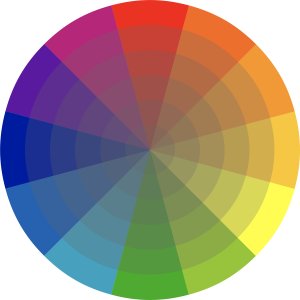 Colours that are right across the colour wheel from each other are called complementary colours, or complements. Complements make great zingers and accents. When deciding how you want your complementary colours to interact, keep in mind that colour plus its complement (in theory, anyway) gives you a muddied look. For example, if you use one colour for your warp and its complement for your weft, the resulting piece can be very muted, possibly more than you expect. If you want that big contrast, keep blocks of complementary colours larger in both the warp and the weft, so that the eye does not blend them into gray. 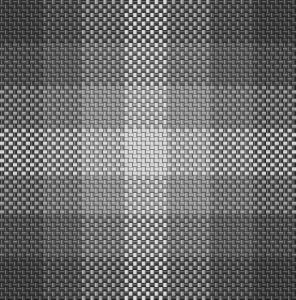 Our plaid sample is a great example of this. We have big red squares and big green squares. Where they weave on each other, they look muddy. But because our eye is drawn to the solid square of each colour, we don’t even notice the muddy areas. For a split complement, we first identify the true complement of a colour. Then we select the colours on either side of it to pair with the original colour. For example, the true complement of green is red. To find the split complement, we look at the colours on either side of red. If you are looking at one colour family and want to find some nice pairings, split complements always work. They make great zingers, too. Start looking for split complements in nature and you’ll start seeing them everywhere. Many of the samples in the previous 2 posts use these principles. Go back and have a look here and here. So happy to share my approach to colour with you. To explore colour further, I invite you to join the JST Online Guild; our 2018 season focuses on Colour & Design, and you’ll receive immediate access to all published videos when you sign up! Click here to learn more (you’ll also receive our free PDF guide, Project Planning 1010). Happy Weaving! Fabulous information Jane. 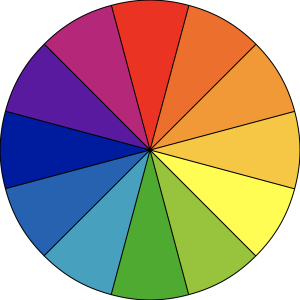 I have been working with a colour wheel but your little notes on each type of colour scheme and explanations are priceless. Delicious! I love cloth, being a singer/musician. The senses are delightfully touched by your love for colours, and explanations! Thank you very much, Jane.